Roger Ebert: The movie's big and expensive and filled with stars, but it's not an epic. It's the longest B-grade war movie ever made. Epics give us a sense of vast events meaningfully in motion; B movies repeat formulas. “Patton," with its clear understanding of the relationship between its events and its main character, was an intelligent war epic and money well spent. “A Bridge Too Far” marches glumly from one cliché to the next. And when I say the movie's filled with clichés, I'm not just throwing the word in for general effect. No, I'm employing it all too seriously in its dictionary sense. NYTimes: What Mr. Levine, Mr. Attenborough and William Goldman, who wrote the screenplay, have successfully brought off, though, is, in the initial sequences, the orderly exposition of what Operation Market Garden was all about, and, in the following sequences, an effective illustration of some of the things that went so wrong. The film is technically a wonder. The shots of the paratroop drops are breathtaking and, if one knows anything about the problems of such filmmaking, the very fact that all the color shots match so well is a major accomplishment. The Guardian: The action scenes are a triumph, visceral and memorable: swarms of planes, massive explosions, hundreds of paratroopers floating through the sky like jellyfish through the sea. If you never tire of watching things blow up while big old bits of machinery rumble around, this is the movie for you. For the rest of us, though, it's kind of boring. The cast, while impressive, is so large that few characters manage more than a cameo appearance. The fighting scenes, while impressive, drag on for so long the mind wanders. The attention to every aspect of the operation, while impressive, hampers narrative pace and direction. By the beginning of the third hour, it seems Attenborough is trying to make his audience feel like they, too, have trudged for days through muddy Dutch fields without food or sleep. Which is an achievement of sorts. Though, when you keep hoping Gene Hackman would turn up with a parrot and an eyepatch and sink his fangs into the Nazi field marshal's neck, you've probably had enough. The movie was kind of an unintentional metaphor for the battle, the way I see it, something that a few of the reviewers appear to believe as well. There was just no way to capture the entire scope of this battle, with all of its complicated, moving parts in the space of one movie. The result was a film that was often hard to follow that had some amazing moments, many tedious moments, some excellent performances, and some dreadful performances, but that ultimately was a disappointment. 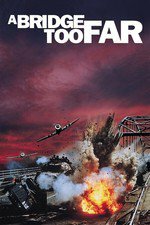 As far as epic movies based on books by Cornelius Ryan, A Bridge Too Far felt vastly superior to The Longest Day, but both of them suffered from being too diffused. I would rather have seen four or five different films based on Market-Garden than to try to see one. The film cannot replicate what Ryan did so effectively in the written form--tell the story of the operation and draw meaning through telling the stories of its individual participants. Ah cool, good to see this up. I've been wanting to watch it since Market Garden's cameo in Band of Brothers, and for some reason "historically accurate (relatively) battle movies" is a genre that appeals to me. A lot of these 60s-70s WWII movies came out as ponderous (Trial at Nuremberg is just as boring as The Longest Day), and while I'm certain my Dad forced us to watch this at some point (The Guns of Navarone was one of the first movies I ever knew), it's about time to tackle it again.